WHILE APPS HAVE pretty much taken over our smartphones, there’s still a place for the humble mobile browser. While it may seem like mobile sites haven’t changed that much in recent times, mobile browsers have become more versatile and diverse in recent years. If you want to change from your standard browser, you’re spoilt for choice as there are a number of great alternatives out there. An obvious one but Google knows the web better than anyone else and is responsible for one of the most popular desktop browsers out there so it’s no surprise that its mobile version is just as good. Bring in voice searching, incognito tabs, and sync options if you use the desktop version making it a seamless transition from desktop to mobile browsing and vice versa. This iOS-only browser is sleek and manages to combine the best of both web and app styles. Coast allows swipe gestures to navigate, a visual approach to search and article suggestions and easy sharing features makes it one of the best mobile browsers out there. It comes with Opera Turbo which helps speed up loading times. On the surface, Link Bubble is a pretty standard browser, but it does one major thing differently. When you tap a link, instead of taking you away from the page you’re reading, it loads that page in the background until it’s fully loaded. It’s a small change, but if you find yourself regularly frustrated by loading times, this could save you a bit of hassle. Another desktop browser that’s made its way to the small screen. 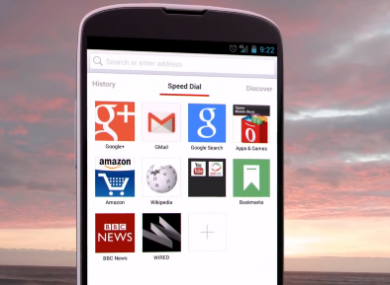 Like Chrome, you can sync it with your desktop browser, but what it has is speed. It’s snappy, to the point and it can use plugins so you can customise your browsing experience further. Opera Mini was designed for those who are on limited data plans, using compression technology to bring down the amount of data needed to load up a page, photo or video. This is handy when you need to be conservative with data, but it also results in quick loading times for most web pages. If you don’t mind a reduction in image or video quality, then you’ll find a lot to like here. Another intuitive browser to use, Dolphin is comprehensive and has a number of different features like add-ons, flash support and gestar support, allowing you to draw to get the site or results you want to make things easy for you. Email “These are the best browsers you can get for your smartphone”. Feedback on “These are the best browsers you can get for your smartphone”.